The Saint Petersburg to Moscow Railway runs for 649.7 kilometers (403.7 mi) through four oblasts: Leningrad, Novgorod, Tver and Moscow. It is a major traffic artery in the north-west region of Russia, operated by the October Railway subdivision of Russian Railways. Moskovsky railway station (Saint Petersburg) (1851) is the northern terminus of the line. On 1 February 1842, Tsar Nicholas I issued a ukase ordering the railway's construction. The railway was a pet project of Pavel Melnikov (1804–1880), an engineer and administrator who superintended its construction and whose statue may be seen near the southern terminus, the Leningradsky railway station in Moscow. The idea of a railway connecting the two capitals gave rise to a prolonged controversy, with some reactionary officials predicting social upheaval if the masses were allowed to travel. It was decided that only the affluent would be allowed to use the line; every passenger was to be subjected to strict passport and police control. 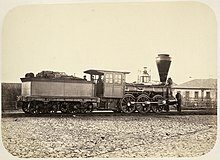 Although the Tsarskoye Selo Railway, built by German engineer Franz Anton von Gerstner in 1837, was Russia's first public railway line, the cost overruns led Tsar Nicholas I and his advisors to doubt Gerstner's ability to execute the planned St. Petersburg–Moscow line. So Melnikov and another colleague traveled to the United States in 1839 to study railroad technology, where they met George Washington Whistler, who designed the Canton Viaduct for the Boston and Providence Railroad. Upon Melnikov's recommendation, Tsar Nicholas I invited Whistler to help build the railway. Whistler left for Russia in June 1842, accompanied by imperial engineer Major Ivan F. Bouttatz, who would become Whistler's friend. He received the Order of Saint Anna by the Russian Emperor in 1847 but contracted cholera and died on April 7, 1849, in Saint Petersburg, Russia, two years before the line was completed. It was built by serfs with heavy loss of life, a fact bemoaned by Nikolay Nekrasov in his 1864 poem The Railway. After ten years of construction, the line opened on 1 November 1851. The first passenger train left Saint Petersburg at 11:15 and arrived in Moscow at 21:00 the next day. When completed, the line was the longest double-track railway in the world. Tsar Nicholas I figures in an urban legend about the railroad. When it was planned in 1842, he supposedly demanded the shortest path be used despite major obstacles in the way. The story says he tried to use a ruler to draw the railroad in a perfectly straight line. By the Msta River the tsar's pencil hit an awkwardly placed finger which he was using to hold down the ruler, creating a bend in the road. The legend says that the engineers wanted to execute the tsar's order exactly, and the result was a perfectly straight road with a single bend. The false story became popular in Russia and Britain as an explanation of how poorly the country was governed. By the 1870s, Russians were telling a different version, claiming the tsar was wise to overcome local interests that wanted the railway diverted this way and that. Actually what happened was that the road was laid out by engineers and he endorsed their advice to build in a straight line. The curve, also called the Verebinsky bypass, was actually built in 1877, 26 years after the line came into being, to circumvent a steep gradient that lasted for 17 km. Heading for St Petersburg, trains would pick up so much speed that they steamed straight past the next station, while those heading for Moscow needed four locomotives to get up the hill. In 2001, Russia's first high-speed rail line was planned to be constructed along the same route, but the project was eventually shelved amid ecological protests and concerns about the fragile environment of the Valdai Hills. 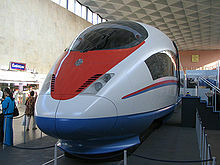 The maximum speed is 250 km/h (155 mph), the fastest train taking 3 hours and 30 minutes. The Siemens Velaro RUS train, also known as Sapsan, has operated on this line since 2009, running below their maximum speed of (300 km/h (186 mph)) because of difficulties upgrading all the track. Russian Railways spent nearly $1 billion on eight trains. Since 1931 the famous Krasnaya Strela ("Red Arrow") train has left Moscow at 23:55 daily, arriving in St Petersburg at 07:55 the next morning, and vice versa. The railway is relatively congested, which means that only a few high speed trains can run each day. There are plans to build a parallel high-speed railway allowing up to 400 km/h, at an estimated cost of 696 bn roubles with an estimated completion in 2018. 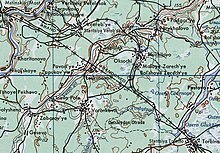 Major stations include (south to north) Kryukovo (Zelenograd), Klin, Redkino, Tver, Likhoslavl, Kalashnikovo, Vyshny Volochyok, Bologoye, Okulovka, Luka, Malaya Vishera, Chudovo, Lyuban Tosno and Kolpino. There are 32 direct express trains daily from Moscow to Saint Petersburg, from which the following are a selection. Moscow–St Peterburg 06:45 10:30 3h 45min "Sapsan", the fastest trains. Moscow–St Peterburg 07:00 10:55 3h 55min "Sapsan"
Moscow–St Peterburg 16:30 20:25 3h 55min "Sapsan"
Moscow–St Peterburg 19:45 23:30 3h 45min "Sapsan"
054Ch Moscow–St Peterburg 23:40 08:35 8h 55min The slowest of the direct express trains. 002A Moscow–St Peterburg 23:55 07:55 8h 00min "The Red Arrow" sleeper train. 004A Moscow–St Peterburg 23:59 08:00 8h 01min "The Express" sleeper train. 038A Moscow–St Peterburg 00:30 08:48 8h 18min "The Megapolis" sleeper train. There are many more sleeper trains. International trains to nearby countries such as Finland and Estonia use this line. The line runs only an absolutely unavoidable minimum of freight trains. However, with only one track in each direction (with the exception Moscow to Zelenograd, which has three tracks), expresses are often delayed by slower local commuter trains. Introduction of Sapsan service saw massive changes in suburban train timetables with some trains now having long stops at passing loops to allow overtaking and others cancelled, causing resentment in towns and settlements along the line. A fourth track between Moscow and Zelenograd is under construction, and there are plans to extend the third track beyond Zelenograd to Tver. On 16 August 1988, 31 people were killed when the Avrora derailed while traveling at high speed on a stretch of defective track near Bologoye. On 13 August 2007 an intercity passenger train to St Petersburg from Moscow derailed shortly before reaching Malaya Vishera after a bomb explosion. There were 30 injuries and no deaths, and railway traffic was blocked in both directions for a few days. Two men from the Ingushetia region of North Caucasus, Salambek Dzakhkiyev and Maksharip Khidriyev, were charged in relation to this incident. They were acquitted in January 2010 on the terrorism charge, but sentenced to prison terms on related charges. The court decided they delivered the explosives to the person who actually planted them, the leader of the terrorist cell, Pavel Kosolapov, at large at time of the trial, but were not aware how it was going to get used. Dzakhkiyev and his defense lawyer, Magomed Razakov, were also convicted of trying to bribe the investigator. Dzakhkiyev was sentenced to ten years' imprisonment, Khidriyev four years, Razakov two years two months. The acquittal was upheld by the Supreme Court in March 2010. On 27 November 2009 four cars from train No. 166 derailed while travelling between Moscow and St. Petersburg. The derailment was a terrorist act caused by the detonation of 7 kilograms (15 lb) of TNT equivalent. At least 27 people were killed and 96 injured. In a secondary explosion on 28 November, directed at investigators, Alexander Bastrykin, head of the Investigative Committee, was injured and hospitalised. The incident was reported to have similarities with the 2007 explosion. 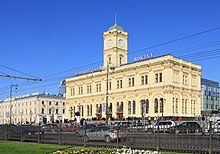 Wikimedia Commons has media related to Moscow-Saint Petersburg Railway. ^ Decker, John C., "Early American Railroad History: A New Source Within Grasp", and  on July 24, 2016. ^ "The Correspondence of James McNeill Whistler :: The Correspondence". whistler.arts.gla.ac.uk. Retrieved August 2, 2016. ^ Wood, Alan (2011). Russia's Frozen Frontier: A History of Siberia and the Russian Far East 1581. Bloomsbury Publishing. p. 148. ISBN 978-0340971246. Retrieved 27 January 2018. ^ O'Flynn, Kevin (23 October 2001). "Tsar's Finger sliced off on the Moscow express". The Guardian. Retrieved 27 August 2014. ^ "Soviet Train Derails; 22 Die, 160 Injured". Los Angeles Times. Reuters. 18 August 1988. Retrieved 27 January 2018. ^ Vishera, Malaya (14 August 2007). "Russia train blast is 'terrorism'". Russia: CNN. Reuters. Retrieved 2 December 2009. ^ a b c "North Caucasus group in Russia train bomb web claim". BBC News. 2 December 2009. Retrieved 2 December 2009. ^ Sergei Mashkin, Oleg Rubnikovich (27 January 2010). "Prosecutors gave up the Nevsky Express". Kommersant. Retrieved 3 November 2010. ^ Приговор о взятке по делу "Невского экспресса" обжалуют в ЕСПЧ (in Russian). RIA Novosti. 13 April 2010. Retrieved 23 February 2011. ^ Aleksei Sokovnin, Musa Muradov (1 April 2010). "Charges and acquittals for Nevsky Express". Kommersant. Retrieved 3 November 2010. ^ "Train derails between Moscow and St Petersburg", BBC. ^ "Part of Moscow-St. Petersburg train derails, several killed", 27 November 2009. ^ "Радиостанция "Эхо Москвы" / Новости / Новости Эха / Суббота, 28.11.2009 / На месте крушения Невского экспресса могло находиться еще одно взрывное устройство". Echo.msk.ru. Retrieved 28 November 2009. ^ a b Abdullaev, Nabi (2 December 2009). "2nd Train Blast Injured Bastrykn". The Moscow Times. Retrieved 2 December 2009. ^ "Радиостанция "Эхо Москвы" / Новости / Новости Эха / Суббота, 28.11.2009 / По предварительным данным, 26 человек погибли и 96 пострадали в результате крушения Невского экспресса". Echo.msk.ru. 29 June 2008. Retrieved 28 November 2009.